In partnership with Tampa Autosports, we are hosting an exotic and classic car show on Saturday, April 27th, from 8am – 1pm. Come see cars old and new from all over while enjoying the atmosphere and food and drink from Heights Public Market. Interested in showcasing your car? 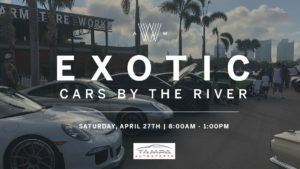 Email Evan at evan@tampaautosports.com for preferred parking and drive … Continue reading "Exotic Cars by the River"
Let's roll! 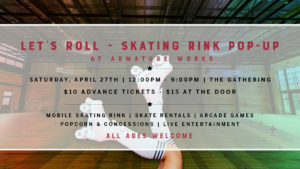 Join us on April 27th, from 12pm - 9pm at Armature Works, for a skating rink pop-up event. Let's Roll will be held in our Gathering event space and will feature a mobile skating rink, skate rentals, live music, arcade games, a full bar, popcorn, concessions and more. This event is family friendly … Continue reading "Let’s Roll! Skating Rink Pop-Up at Armature Works"